I'll be off for a week or so, so here are a few snippets to keep you busy. THURSDAY 6 MARCH is Hungarian Dances publication day. I will be at Richmond Library, Little Green, Richmond-upon-Thames TW9 1 QL to introduce the book at 6.15pm. Readings, questions, refreshments, signed copies etc. Admission free, but please reserve a place by phoning 020 8940 0891. FRIDAY 7 MARCH I will be at East Sheen Library, Sheen Lane, London SW14, for a teatime intro to same, at 3pm. Readings this time from ace local actress Geraldine Moffatt (who was in Get Carter), plus intro, questions, signed copies, refreshments provided. Admission free too, but please reserve a place by phoning 020 8876 8801. The book is now in stock at Amazon and can be ordered here. And to put you in the mood for this very violiny tale, here is Jascha Heifetz playing Dohnanyi's Andante Rubato Alla Zingaresca, with a wonderful Hungarian Gypsy photo montage. Enjoy. To forestall any more barbed comments from the likes of Viola in Vilnius below, this is just to say I am, as a friend of mine would say, "under the snow". Normal blogging, both writing and reading, to resume as soon as humanly possible. First it was classical music in the London underground to soothe commuters. Now it's ballet-dancing traffic cops - at least, in Timisoara. Read all about it. More about traffic, too, in the marvellous tale of how a motorbike courier made everything possible for ace soprano Marina Poplavskaya, who's about to sing Tatyana in the ROH's Eugene Onegin - here's my interview with her from yesterday's Independent. Spassiba balshoy, Marina, and toi-toi for the big day! 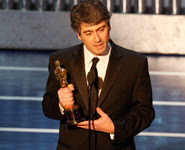 Big cheers and congratulations to our fabulous Italian turned Londoner Dario Marianelli, whose music for Atonement last night scooped the Oscar for Best Original Score. Watch his 'thank-you cam' spiel here. And for a more in-depth look at the score, read his interview at Music from the Movies here. Heard the one about the naked busker in the ROH 'Salome'? If not, hear it in the Sunday Times today, here. Meadows, 35, will appear in a new production of Richard Strauss’s Salome, where he will take centre stage at the end as the executioner, chopping off the head of John the Baptist before handing it to Salome. How did a busker capture the spotlight inside Covent Garden? The transformation began when Meadows, a body builder and former Mr Wales, was spotted in the piazza outside the opera house by David McVicar, one of the world’s best opera directors. The Shchedrins have been in town for last night's UK premiere, chez BBC Maida Vale, of Rodion Shchedrin's Concerto Parlando for violin and trumpet, written for Philippe's festival in St Nazaire in 2004 and now recorded by said violinist, trumpeter Martin Hurrell and the BBC Symphony Orchestra conducted by Mikhail Agrest for future broadcast on BBCR3 and, we hope, an eventual CD. This morning I went to interview Shchedrin, who is not only charming but utterly fascinating (more of this in due course). His wife, Bolshoi prima ballerina assoluta Maya Plisetskaya, kindly autographed one of her DVDs that I'd brought along. So Sunday morning a blog comment pops into my inbox from our Ozzie-in-London reader Anne, offering a ticket for Barenboim's last Beethoven recital that afternoon. I dropped everything (indeed certain people would be justified in not talking to me for a while) and ran. It was indeed a remarkable occasion. Got there to see banks of seats in the foyer where usually there are none: the box office area looked like hospital outpatients, with around 40-50 people sitting in wait for returns. On the ballroom floor, a big screen was ready to relay the concert to the overflow - at first there were about 20 seats in front of it, but many more appeared as if by magic as time wore on. In a boxed-out area near the Mandela door, a film about Barenboim was being screened, so I went to have a look. He talked about how his grandparents arrived in Buenos Aires from Russia and got married on the boat, how there was always music in the apartment because everyone who visited was there for a piano lesson with his parents, and how the Argentinian capital was a melting pot of religions and nationalities over which nobody worried for an instant. Then someone's mobile rang and instead of soaking up the maestro's words of wisdowm we were all treated to her bellowed conversation: "I'M IN THE ROYAL FESTIVAL HALL WATCHING A FILM ABOUT BARENBOIM, IT'S ABSOLUTELY FASCINATING..."
Rather than placing the three last sonatas together, Barenboim had chosen to mix the early, middle and late works in each programme. This one consisted of Op.14 No.1, Op.7, Op.54 and Op.111. Several points stood out a mile. One was how anybody could make the harmless little Op.14 No.1 sound like a masterpiece. The next was how Op.7, which I love and have learned, but seemed to be hearing for the first time, could suddenly shine out as the Eroica Symphony and Fidelio rolled into one. And a third: Barenboim literally made the piano sound like an orchestra. Every phrase seemed to be assigned an instrumentation, and by some bizarre alchemy the sound of that instrument came gliding out of the Steinway. No doubt about it: the final phrase before the last deep trill of the introduction of Op.111 was a trio of French horns. Don't ask how he does it: I've no idea. Later a record producer friend remarked to me: "Normally, if I heard someone play the piano like this, I'd say he ought to become a conductor." And in terms of velocity and accuracy Barenboim's technique, to be frank, ain't what it used to be. Anyone who doesn't allow for pianists to play wrong notes or occasional unevennesses wouldn't have been happy. But if musicianship of old-fashioned, idealistic grandeur, seriousness of purpose and deep, complete assimilation of not just the music but the kernel of its spirit still counts for anything in this mad world, this was the proof. I've recently been reading a book by Swami Omananda Puri, a.k.a. the second Mrs John Foulds (real name Maud McCarthy) which is filled with extraordinary soundbites of eastern philosophical wisdom. She asserts that Beethoven kept a copy of the Upanishads on his desk. I can't say whether or not this is true, but hearing Barenboim play the second movement of Op.111, I could believe it. Who can interpret what lies behind late Beethoven? Yet to me it has never seemed clearer that the variations follow a mystical pattern. Simplicity and purity; growing life that builds to full tilt (if a somewhat stately version in Barenboim's hands); subsiding into exhaustion and the temptation of death's freedom; transformation of the soul beyond the body; heaven; and finally a descent into the simplicity and purity of rebirth. Too much of a mystical absorption to allow for tears, but later I compared notes with a friend who, like me, has lost much close family - we had both experienced lingering thoughts of them. You may think all this is tripe, of course, but it's a true reflection what went through my mind listening to this concert - so take it or leave it. Something about the afternoon felt deeply valedictory. All right, it was the last concert of a very intense series, but I know I wasn't the only person present wondering whether we will ever see Barenboim play these pieces again here. There's no particular reason to believe that we won't - but this felt like a farewell, the end of an era. There was a good ten-second silence at the end. Then the clapping, and everyone stood up straight away. Was the applause for Barenboim's playing, or his personality, idealism and downright statesmanship in being one of the few public figures who talks any sense about the Israeli-Palestinian situation? I suspect the split was respectively about 40% to 60%. I still prefer his old recording from the 1960s. But I'm glad I was there. I have a piece in The Independent today, exploring - in the wake of Barenboimania - why profundity is good box office at the moment. Thanks to doughty reader Anne, who offered me her spare ticket for Barenboim's last recital on Sunday afternoon, I was present at the final installment of the Danny-&-Ludwig Show. I am preparing a detailed post about it, but have had One Of Those Weeks and as yet no chance to finish the thing. Check back soon. After months, nay years, of hoping and hunting, I finally found something I always hoped must exist: film of Distant Cousin Eddy Duchin at the piano with his band, dating from 1936. OK, we could have done without the roller-skaters, but long-lost coz seems adorable: full of charm, fun and musicality. Had a good trip recently? 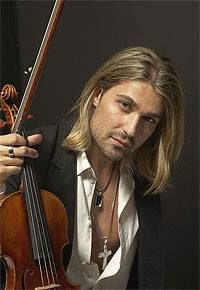 Violinist David Garrett fell down some stairs and smashed his Strad, the 'San Lorenzo'. Ouch. Perhaps I'm thick or something, but I hadn't come across this guy before. The article in yesterday's Indy linked above says he's one of the country's foremost young performers, previously a child prodigy and now 'the David Beckham of the violin' (hmm, given the photo I'd say that's being unfair - he's actually rather dishier, n'est-ce-pas? And playing the violin is a far sexier thing to do than screwing up the penalty shootout....[fanfanfan]). Of course, it's not impossible that the reason I haven't heard him play is that he does stadiums, and I don't tend to go to them, preferring the up-close-and-personal experience of places like the dear old Wiggy. Sample the video on his site and don't be put off by the woolly hat - in the interview he says he's a disciple of Ida Haendel. Guess what, his new album 'Virtuoso' is being released in the UK on 24 March. It also turns out that he's at the Barbican tonight. Playing, uh, Valentine's Day Love Classics (ie, the Bruch) with the London Concert Orchestra and conductor Robert Stapleton, promoted by Raymond Gubbay. I don't recommend breaking your violin, ever, for any reason - but hey, it's great publicity, and the timing couldn't have been handier. On other occasions, I regret to say I've come across fiddlers (no names) who've had reason to collect on the insurance on their valuable instruments and enjoyed the resultant pleasant change of lifestyle. Yours truly, being a confirmed fiddle fetishist, is now heading for a cold shower. Happy Valentine's Day to one and all. After being overwhelmed by the wisdom of Barenboim on Newsnight - yes, real coverage of a real classical artist on a real current affairs programme is still possible, just - this Britblogger is overwhelmed all over again by discovering a tribute from Opera Chic, blog skyrocket style guru from Milan! Aw, shuks... Well, that's the first and last time my picture will ever share a screen with 'PregsTrebs'. The actual publication date is 6 March, but Solti insisted on posing with the book as soon as it plopped onto the doormat. Michael Church writes an ecstatic review in today's Indy of Barenboim's latest recital in his Beethoven Sonatas cycle at the RFH. I apologise for not being able to write one myself, but actually I can't get IN, having not planned ahead. I'm simply not used to a situation where you cannot get a ticket for a piano recital in the Royal Festival Hall for love or money. If Beethoven's 32 piano sonatas are classical music's New Testament, Daniel Barenboim is turning us all into his disciples. Special seating has been installed for those queuing for returns, and the standing ovations are extraordinary: these things usually start with a few groupies, then others gradually haul themselves up, but with Barenboim, the whole hall is on its feet in a trice. And I can't recall a musical series with so many big- and small-screen stars attending night after night. This disarmingly modest man has become a cultural messiah. Apart from the fact that I wouldn't really describe Barenboim as 'disarmingly modest' (having interviewed him a couple of times), what I can't quite get my head around is the idea that this is being regarded as something new. I learned all the Beethoven sonatas - by ear - as an insomniac teenage piano-nut with a turntable, headphones and the LPs of Barenboim's Complete Beethoven Sonatas on EMI, recorded back in the late 1960s. Our Danny was in his twenties. They are stupendous. When I wasn't listening to him, I was listening to Schnabel, who was also revelatory - but it was Barenboim who grabbed the imagination's heart-strings from note no.1; somehow one sensed his identification with every aspect of Beethoven, from the profound mysticism to the humour, from the personal tragedy to the great humanitarian idealism. And now, if Beethoven is the most idealistic composer who ever lived, he could have no better match than Barenboim. If you can't get into the concerts, just have a listen to those discs. UPDATE: Wednesday, 9.15am: Intermezzo offers some advice on how to (try to) get in. George's comment on the 41 Hours post, asking about the LPO programming for the 08-09 season, is timely. He wants to know why Vladimir Jurowski has scheduled works he's conducted recently such as the Tchaikvsoky Pathetique and the Rachmaninov Symphonic Dances. I may be closish to my orchestra-in-law (does this make Vladimir my principal-conductor-in-law?) but I'm not privy to their decision-making processes. In the speeches at the launch, however, Vladimir and MD Tim Walker announced that one important theme in the season will be Tchaikovsky, the influences upon him and his influence on his successors. I guess you can't do that without those two works. The crucial thing, it seems, is hearing them in a different context, coming to the music from an alternative vantage point that can change the way you listen to it. Martynov says: 'Dante's Vita Nuova is not a text about love. It is a text about text about love. Likewise, my opera Vita Nuova is not just an opera. It is an opera about the history of opera as the most important genre in European culture. It goes back even beyond the earliest operas to reveal the genre's historical prototype - a medieval miracle, but dressed in the alluring beauty of high-Romantic operatic language'. If only this was what music-making could be all about, a little more often, a little more now. ...if you haven't already. The British prodigy of Russian ancestry and inclination is a very busy lad. Here's my piece about him - and prodigydom - from today's Independent. 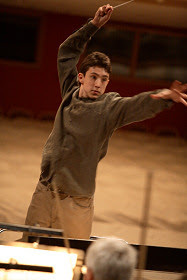 The online version includes a video clip from his new ballet, Mowgli, which he's just been conducting (yes, conducting at the tender age of 15) in Moscow. I haven't quite worked out how they could call the performance on Sunday the 'official world premiere' when the thing has already been performed, last summer, but that's publicity for you. Or someone. On the strength of the video, the ballet seems unlikely to set up in competition with Disney or The Lion King, but the rate at which young Alex is churning out music is absolutely amazing. The real test will be what he's doing when he's twice, or three times, his current age. * ... Christian Tetzlaff's E string broke in the first bar of the Brahms Violin Concerto finale chez LPO/Jurowski on Saturday night. He zipped off the stage to change the string rather than grabbing Boris the leader's fiddle. Apart from that, the best Brahms concerto I've heard in 20 years. * A mobile phone going off in the last bar of the Tchaikovsky Pathetique in same concert. Vladimir held up his baton after the basses reached the end and maintained silence until the ringing expired. It became the spookiest moment of a staggering performance - almost like the death of Tchaikovsky's own phone. * A study-day on Messiaen's Quartet for the End of Time at the QEH yesterday. Included the very first screening of a new film about its origin, entitled 'The Charm of Impossibility'. Fabulous. I urge all Messiaen fans to see it if and when they get the chance. * A quiz at the Royal Opera House in aid of the National Youth Orchestra, at which the great and good of the musical world, including the national broadsheet newspapers, the National Theatre, the ROH, a bunch of 'Maestri', BBC Radio 3, the Barbican, etc, buy tables, build teams and compete against one another. Now a well-established annual highlight, though this was the first time I'd taken part. The Guardian won again (it usually does), even though its editor is chairman of the NYO and organises the shebang. It was b****y difficult, too, heavily biased in favour of those who know how to handle early music, Britten and crosswords. * Heard extract of Jonas Kaufmann's long-awaited new operatic aria disc on the radio. Meistersinger Prize Song - taken so slowly and rendered so sentimental that all the stuffing fell out. It was positively painful - and a terrible disappointment to those of us who were trying so effortlessly to love him. * Hubby's departure on tour to Toulouse and Spain at 5am today. * The news, fresh from Opera Chic, that Anna Netrebko and Erwin Schrott are pregnant!! Blimey. Time for a trip to the gym and a stiff g&t. More and more stations on the London Underground are piping out canned Mahler to calm us all down. Neil Fisher has an article about this in today's Times. Is it about crowd control, banishing yobs or persuading us that our commuting lifestyle is pleasant? Quietly, steadily and, if not secretly, then certainly stealthily, London Underground is rolling out a compulsory classical diet. And it's joining a growing group of local authorities, transport companies and even supermarkets across the country. The idea? If we are all stressed out, we need calming down. And if we are antisocial yobs looking to cause some bother and steal Travelcards, we need moving on. Somehow classical music seems to fit the bill in both cases. Perhaps this is why Brixton is already well used to it, as I discover while the blast of Schubert's Unfinished is throbbing through the ticket office on a Tuesday lunchtime. The station first got plugged in more than four and a half years ago, a test site to see whether the embryonic scheme deserved expansion. Clearly it seemed to do the job; as of the beginning of this year 40 stations have now been equipped with the necessary kit, and they range from the positively genteel (West Brompton) to the Wild East of the District Line - Dagenham, Upton Park - alongside more mixed South London spots such as Balham and Morden. I'm interested in the question of who chooses the music - see later in the piece for info on the 40-hour playlist - not least because I'm convinced he/she has a macabre sense of humour. I was at Vauxhall Station the other week, trekking from South-West Trains to the Victoria line to get into central London, and unfortunately for me it was rush hour. The glum-faced populace plodded en masse at the necessary snail's pace towards the ticket barriers. And what were they playing over the Tanoy? Mahler's Symphony No.1, slow movement.